On Facebook, I've seen some advocates of abortion bans claim that her death cannot be definitively proved to have been caused by the failure of the doctors to abort her dying fetus. That's true, but utterly beside the point. Very little in medicine is cut and dried. The human body is immensely complex, and doctors mostly deal in probabilities, not certainties. That's part of why it's so important for each person -- guided by the advice of her doctors -- to make her own decisions about her medical care. People differ in their values, and hence, in the risks they're willing to accept or not. For a person to be free to live her own life requires that she be free to decide what risks to take with her own body and health -- without interference from the government. For the government to dictate or outlaw certain kinds of medical treatments means subjecting people to risks contrary to their own best judgment of their own interests. That's a violation of their rights, plain and simple. That's true for all medical care, including abortion. That's why laws banning abortion violate rights, even when they allow for exceptions to save the life of the mother. All pregnancy is risky: the maternal death rate in the United States is 16 out of 100,000. Many women are unwilling to undergo that risk, not to mention all the other complications and risks of pregnancy -- and rightly so. Because the embryo/fetus is not a person with the right to life, a woman has the right to decide, based purely on her judgment of her own best interests, that she's not willing to bear the risks of pregnancy, and hence, to terminate her pregnancy. 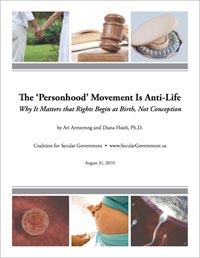 In contrast, under laws that permit abortion only to save the life of the mother, doctors would be constantly subject to second-guessing by police, prosecutors, and courts -- and perhaps, subject to very serious criminal charges for murder or manslaughter. That's why women die under abortion bans, regardless of provisions that permit doctors to act to save the the woman's life. The doctor cannot afford to be blind to the risk to his own life and liberty of performing an abortion, even to save a woman's life. The advocates of abortion bans seek to evade the consequences of their own policies when confronted by these kinds of cases by claiming that the woman might have died anyway, even if she'd been able to terminate the pregnancy. That might be true, but that should have been her decision to make. Instead, she was preventing from acting based on her own best judgment in service of her life. That's a major violation of her fundamental rights. Ultimately, as Savita Halappanavar's husband said, "It was all in their hands, and they just let her go. How can you let a young woman go to save a baby who will die anyway?" I've said it before and I'll say it again: opposition to abortion rights is not "pro-life."